Continuing on west from the porch, near the south west corner of the church, there is a large monument, which is a memorial to Dr John Cheyne, who died in 1836. 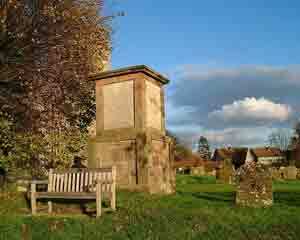 This tomb is the largest within Sherington churchyard. The following notes were published on page 12 on Friday 16th June 1971 in the ‘Bucks Examiner', by their Sherington correspondent Eileen West. 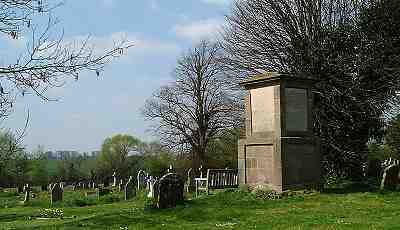 Since this picture appeared in the Bucks Standard in May it has now been confirmed that the memorial in Sherington churchyard was, in fact, dedicated to Doctor John Cheyne, who was once Physician-General to the Army in Ireland. The book, from which most of the extracts and information came was borrowed through the Newport Pagnell branch of the Bucks County Library. Called 'Essays on partial derangement of the Mind’ was eventually located at Bristol Public Library by Mr. Norman Stone, Newport Pagnell’s librarian. An opportunity to say 'thank-you" to the extremely helpful library staff in the town. Dr. John Cheyne was born on 3rd February, 1777 in Leith, Scotland. At the age of 13 years, he began to attend his father’s poor patients, and to ascertain that they were supplied with medicines, to bleed them, dress their wounds and report upon their condition, thus acquiring an early acquaintance with diseases. He attended medical lectures in the University of Edinburgh, and at the age of eighteen year, obtained a Medical Degree. On the day after he obtained his degree (having previously passed an examination at surgeons Hall) he left Edinburgh for Woolwich, the headquarters of the Royal Regiment of Artillery, as assistant-surgeon, where he served with them, in various parts or England, until the end of 1797. When he obtained the local rank of surgeon, he accompanied a brigade of horse artillery, commanded by Lt. Col (afterwards Sir) Edward Howarth to Ireland, and was present at the actions with the rebels which took place at Ross, Vinegar Hill, etc. in 1798. In 1799, he left the horse artillery and returned to Scotland, where he was appointed to the charge of the ordnance Hospital in Leith Fort; also taking on as assistant to his father, whose practice, especially among the poor, was very extensive. At this time, Dr. Cheyne formed a friendship with Mr. (afterwards Sir) Charles Bell who was at that time occupied in the study of pathology, and Dr. Cheyne learned many things from this association. After passing nine years in the study of pathology and the practice of medicine, Dr. Cheyne left Scotland and moved to Ireland where he set up practice in Dublin. In the latter end of 1811 he was made Physician to the Meath hospital, and was also lecturing at the College of surgeons, and in addition to this, in October 1815 was appointed one of the physicians to the House of Industry. Some years later Dr. Cheyne was made assistant to Dr. Percival. It was upon Dr. Percival's resignation that Dr. Cheyne was appointed Physician-General to the Army in Ireland on the 7th October, 1820. In the year 1825 he became affected with a species of nervous fever, but continued in Dublin until 1831 after which he came to live in England in the Manor House at Sherington. Although his health was slowly declining, he devoted three mornings a week to receiving sick villagers, at a neighbouring cottage, where he gave them advice and dispensed medicines. Another morning of the week was devoted to receiving sick people from distant parts of the country. During the next few years a cataract formed in his right eye and his strength became so much exhausted, that he altogether ceased his profession. It was in these last few years of his life, that Dr. John Cheyne wrote his book entitled. 'Essays on Partial Derangement of the Mind - In supposed Connexion with Religion,' which was published in Dublin in 1843. In a very few months after he made his last corrections to the manuscript of this work, he was confined to his bed and died some six weeks later on the 31st January, 1836, a few days before his fifty-ninth birthday. "My body, attended only by my sons, is to be carried to the grave by six villagers, very early on the fourth or fifth morning after my decease. I would have no tolling of bells, if it can be avoided. The ringers may have an order for bread, to the amount usually given upon such occasions; if they get money they will spend it in the ale-house and I would have them told, that in life or death I would by no means give occasion for sin. My funeral must be as inexpensive as possible: let there by no attempt at a funeral sermon. I would pass away without notice from a world which, with all its pretensions, is empty. - 'Tinnit, inane ext. ! 'Let not my family mourn for one whose trust is in Jesus. By respectful and tender care of their mother, by mutual affection and by irreproachable conduct, my children will show their regard for my memory. My decease may be announced in the Irish newspapers in the following words "Died at Sherington, Newport Pagnell, Bucks, on the - day of - Dr. Cheyne, late physician-general to the forces in Ireland.' Not one word more, no panegyric." "Reader I the name, profession, and age of him whose body lies beneath are of little importance: but it may be of importance to you to know, that by the grace of God, be was brought to look to the Lord Jesus, as the only Saviour of sinners, and that this 'Looking unto Jesus' gave peace to his soul. Reader: pray to God that you may be instructed in the Gospel, and be assured that God will give his Holy Spirit, the only teacher of true wisdom, to them that ask him"
"If any objection be made to the spot pointed out for the interment of my body, let some other be chosen where the inscription on the column to be erected over me may be seen to advantage. The monument is for the benefit of the living, and not in honour of the dead." "I wish the inscription to be preserved, and leave this to my children and my children's children." These directions were scrupulously attended to and the monument which marks the spot where Dr. Cheyne lies buried, besides the texts and inscription given above, bears only the initials, J.C. According to Derek Ferris, in the 1980’s, a decision was made to fell the enormous, but decayed lime tree, that was in the churchyard adjacent to the John Cheyne monument. The tomb is listed, as an ancient monument. Major Chester’s help was enlisted in this project, with ropes, chainsaws and a tractor in the field, to keep the tree falling away from the monument and the church. Apparently the tree was completely hollow and dead. So the method was to saw all through the base and pull the tree over towards the field. The team accomplished the first half of the project and sawed through the base, attached the tractor by ropes etc. and began to pull, but the tractor was not man enough to do the job and its clutch failed. Then the decision was made to use a winch, on the tractor, this also failed to be adequate and the great tree began to topple and as it fell a large branch caught the corner of the John Cheyne monument and demolished it. Luckily the team were able to keep the tree away from the church buildings. The tree with the aid of Phil Smith was sawn up and disposed of. 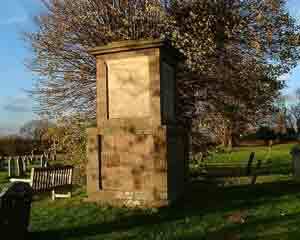 Later a grant of £1,000 was obtained from Milton Keynes and again with the help of P. Smith, the monument was re-built.